The best and unspeakable taste. Our adventure, which started in a small shop in Körfez in 2004, has reached across Turkey today. The pastries from our mothers’ hands are eaten lovingly all over Turkey. The greatest feature of Göçmen Börekçisi is the lightness of our pastries. 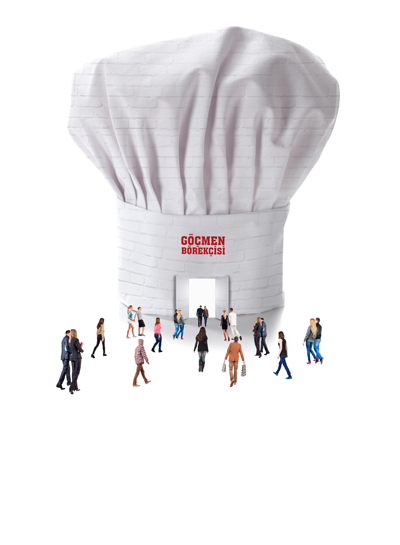 We have completely eliminated the heavy smell of oil and heartburn that have been engraved in the people’s mind with GÖÇMEN PASTRY. Our pastries are completely made by HOUSEWIVES, not produced by fabrication machinery systems. Therefore, our customers comfortably eat our pastries, which are just like their mothers’, for many years. Our pasties are produced closed shops with 3500 m2 in Kocaeli – Körfez and are supplied through our dealers in Kocaeli, Sakarya, Istanbul, Bursa, Ankara, Bolu, Çanakkale, İzmir, Karabük, Tekirdağ, Antalya and Saudi Arabia. We grow up with more than 70 dealers in our country. In Göçmen Börekçisi, while our masters are preparing our pastries and buns, they use fresh doughs that they have rolled right away as well as considering all details from kneading the dough to its fermenting time.